Changing a motorcycle tire can be fun. 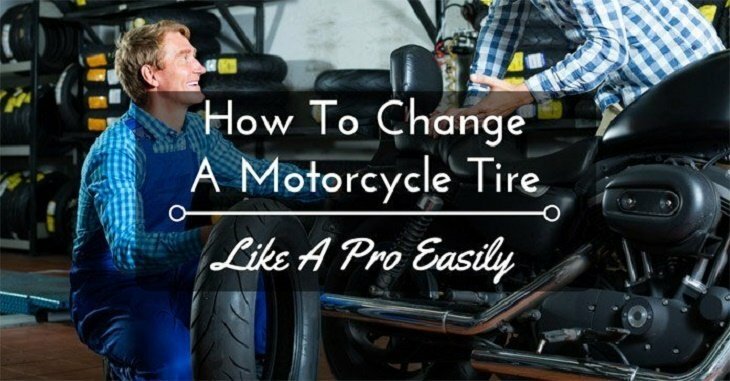 Learn how to change a motorcycle tire easily by checking out this guide. You will be an expert in no time. Changing a motorcycle tire for sure looks easy to some people, but there is a process involved in making it happen. Sometimes people end up giving up on making the change themselves and opt for a garage to help them do that. If you are going to change the motorcycle tire on your own, it is crucial that you get to do it right always. You have to use the right technique and tools to ensure you end up with the correct tire change. In case the tire change is done incorrectly, it may lead to some issues such as accidents. You must be eager by now to know how to change a motorcycle tire. Let us get into it right away. To make the whole process of changing the motorcycle tire great, you need the right tools. The following list includes most of the tools you will need for a tire change. The process of changing a motorcycle tire involves removing the old tire and then replacing it with a new one. Below are the steps to follow to remove the old tire. There is no way you are going to remove the tire from the rim when it is still inflated. The first tool to use for the process is the valve core tool. The work of the tool is to keep the valve open to remove all the air from the tire. You simply have to screw it on or snap it into position depending on the type. Most of the time the air would be coming out too strongly, so support the valve core tool in position tightly. Once the air is all out, you would feel that the tire has less tension and it is now easy to go to the next step. This is an essential step you must keep in mind if you are looking to have an easy time putting the tire back on the rim. You have to mark on the rim the direction of how the wheel spins. You could use a pencil or marker. The important thing is to make sure that it is visible. If you are not sure of how the wheel normally spins, you can place the wheel closer to the bike just as the way you took it off. It would give you an idea of how the direction of how the wheel was supposed to be turning. The bead is commonly called the inner edge of a tire. To do this, you would need to use the bead breaker tool as suggested from the list of tools above. The tool would be made of a strong metal based on the amount of work it has to do. To break the bead, you have to place the tool between the wheel rim and tire. Jostle it a bit until there is a pop sound. That sound shows that the bead is now loose. You have to do it all around the edges to remove any part still attached to the rim. The silicone lubricant is quite crucial if you are looking to remove the tire from the rim. Since it is a spray lubricant, applying it to your tire and rim should not be hard at all. The lubricant will enter under the bead and rim so that you can easily remove the tire. It should be easy to remove the tire all around the rim. In no time, you should have been able to completely slip off the tire. The trick is to always spray the lubricant once you expose the bead. It makes it easy to remove all the beads quickly. You could also use some Windex in case you are looking an alternative to the lubricant. Even with the lubricant, sometimes you might not always remove the whole tire. You will need the tire levers to help pry the bead out of the way and remove the tire completely off the rim. The tire levels are not any fancy tools; they are just long metal tabs. To use them, shove the levers under the bead and press it against the rim. In this case, your rim acts as a fulcrum until you hear a popping sound. Do it in a circular motion until the whole tire is off. It is often that sometimes you may end up with nicking your rim. It is crucial that you take precautions. You may have to use the rim protector to keep the rim from chipping or bending. Well, just like that, you are halfway through the process about how to change a motorcycle tire. Now you have to think of how to put a new tire back on the rim. Installing the new tire might not always involve using a lot of brute force as compared to when removing, but it also needs the right amount of carefulness and skill to get the tire back on the rim. Check out the following steps on how to do it. Just as you would have done for removing the tire, you still need to lubricate the inner walls of the tire to make sure working with the tire is quite easy. You will need to spray the silicone lubricant thoroughly around the inner walls of the time to ensure that you have a slippery inner wall for fitting on the rim. You could still use Windex, which is a great alternative for those looking for another easier way of slipping the tire onto the rim. Do you remember that we had marked a point on the rim to show the direction of the rim? Well, it is now time that you put to good use of that marking. You now need to place the new tire aligned towards that direction. Another thing to note when installing the new tire would be a red dot on it. The dot normally tells you that this point has to be next to your valve stem of the tire. Once you have aligned the dot with the valve stem and set up the direction, it is now time to start installing the new tire. You will need to use the tire irons at this point. You will have to place the tire iron between the rim and tire so that you can easily pry it into position. You also have to be careful with the tire irons so that you do not nick the rim. In this stage, you would be using the bead of your new tire as the fulcrum as a way of minimizing the damage to the rim. You simply have to push away the tire and ease the bead section to get under the rim. Once one side is done, you can flip it and do the other side just as you did the other. With the new tire in position, you now have to start inflating the tire. At this stage, you do not have to fully inflate it, but rather just enough. It is advisable that you inflate the tire until you hear popping sound. Such sound indicates that the bead is now in position. With a small hammer, you could hit around the bead to ensure that it is in position. To make sure that the tire works properly, there is the need to seal the bead into the rim with the Breezer tire tool. It is commonly used in the case there is no pop sound when inflating in the first place. The Breezer tire tool is important to get the bead into position. You can now reinsert the valve stem into position and tighten it enough so that it does not move. At this point, you can now inflate the tire as per given pressure level. Once you have fully inflated the tire, you should be good to go. As you can see, it may be a lot of work, but once you get used to changing the tires, it can be quite simple. You will need to have the right tools always if you want to end up doing the job correctly and faster. ​I hope you have enjoyed and learned something new from the tutorial. You can always post some comments in the comment section below and share with other people for them to learn more about how to change a motorcycle tire.